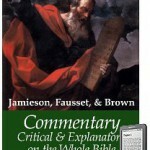 Posted on May 10, 2011 March 27, 2014 by Walt Rice, Jr.
My Kindle version of the venerable JFB commentary. Better than the other slop on Amazon. I got a Kindle from my mama and papa for Christ­mas, and I absolutely love it for reading — and only for reading. Light in my hand, reads with natural light, not the glow of a com­puter screen, and is purpose-focused on just one thing: reading. One of the biggest dis­appoint­ments, however, is that many of the books available from Amazon are abso­lutely horrendous in their digital format­ting. The text often looks like it was OCRed and not corrected. Words are mis­spelled, missing, or run together. And these issues are horribly worse with the public domain materials, which seem to be, for the most part, sloppy auto­mated re­packag­ing of Inter­net Archive output. There may or may not be the nec­essary links to navi­gate the book (table of contents is a must, and an index is often helpful). Amazon at least gives this slop out for free, but there are a slew of shady publishers on the store who like to charge for it. All of which gives a very bad experience for a user who actually likes to read, and cares about things like text, format, and setting. I can’t save the world, but I can contribute better things. So I figured out how to make Kindle eBooks and distribute them in Amazon’s store. I’ve done two books so far: a short one of the Westminster Confession of Faith, with integrated Scripture proofs, and the longer Commentary Critical and Explanatory on the Whole Bible, by Jamieson, Fausset, and Brown. I think they are two great resources for Kindle, and are pleasant and useful in a properly formatted ebook. If you have a little spare change, I’d be honored for you to buy them from Amazon (99 cents and $3.99, respectively). If you’re hard up for cash, let me know and I’ll send you the book files directly. Another publisher who cares about such things and seems to have invested significant effort to make usable Christian resources is OSNOVA. Don’t know the guy, but he is a conscientious guy and I think you’ll appreciate his materials. Tristan on Access 2007 Debugging Disabled?